Jo-Anne Schneeweiss and Shelley Sefton have identified and defined Creative IQ(R) as an important part of a child's development in their newly released book. Creative IQ(R) has quickly been recognized as a valuable resource for both parents and teachers. The pages contain over one hundred activities plus challenges within ten themed chapters, aimed at helping parents and teachers give young learners the creative edge in a competitive world, as the title suggests. Creative IQ(R) defined. The ability to confidently develop and express creative, out-of-the-box solutions to challenges, relating to every aspect of life. The importance of developing Creative IQ(R) is clear. Children with the ability to think, process information and express themselves creatively will have an extra set of skills to draw upon as broad-minded, motivated results, confident in their ability to make a valuable contribution to any group or endevour. 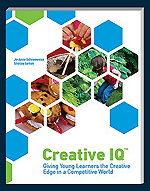 Creative IQ(R): Giving Young Learners the Creative Edge in a Competitive World is now available at chapters.indigo.ca.